There seems to be a flood of "What should I buy" type topics lately. The problem with these topics is that if everyone made one over ever purchase the forum would become unreadable. Thus to solve this problem this topic has been created to be the new home for all such questions. thanks for reading, and hopefully posting. It is very wise not to deal with money you will probably have when they come out but with what you have now, first of all. Congrats on that, not everyone is that mature when it comes to our favourite hobby. What Benny said is true, there is no need looking on brickset, lugnet or here what people claim or rate the best set, it is all up to you. I wonder if watching the series will make you want one specific set even more, when is it coming out in the US anyway? (hope you got what I meant: the Falcon is only so popular cause of its "role" in ANH and ESB for example) Perhaps that could have an influence on you too.. For my part, I am already highly addicted to the landing mechanism of the v-19, though it is quite expensive and has no good figs. The AT-TE looks nice but boring and the RGS is well... it is the RGS! You cannot go wrong with it and the playability with the rear doors and front things seems also quite nice. Just my impression, sevy. Hope you will be happy with your decision, there is nothing better than preordering lego! I think these topics are silly. Just buy what you can afford and what you like! Search your inner self... what does it tells you? And then decide what brand to buy. All the brands you mentioned are great. If I have to choose, I would go with Indiana Jones because I'm into that kind of adventure/theme. Good luck! First I suggest you calm down. Then I think you should consider the fact that nobody has seen any of the 2009 sets and we don't know what to expect. Once we do get these pictures and then when we get the prices for the sets then you should start considering which sets you wish to purchase. Also I wouldn't get your hopes up about Harry Potter as only one set was made for the previous film and no offical statement has been given on it's future. I don't think LEGO will be making Harry Potter 6 sets. I'm not sure about more Indiana Jones sets either, but I guess they're likely. I would buy a few sets from Indiana Jones, a few more from the Elves and all the sets from Harry Potter and the Halfblood Prince. I wouldn't buy a set without knowing what it actually looks like! I'm going with Indy and Castle. If I had to pick between the two, I'd probably go with Castle, as they're not fleshtoned. Though Indy has potential to offer some nice specialized pieces. I don't know that there is going to be a HP6 line. Though Indy was confirmed. I do agree with everyone else, however, that this is a silly topic, as we haven't seen any sets. So any opinions I have are based on my vision of ideal sets for each line.
? Indy is a license, so why not? I do see your point on HP, though. I'd go with Indy and Castle, mainly 'cause that's me. On the other hand, what do YOU like? Why not just buy smaller sets of each first, so you can have all three. Then decide on a bigger set depending on which theme has the best/most appealing/etc. HP might appear, to work off the movie. Indy might disappear if there's no interest/demand for it. The Castle theme is a classic, but the Elves is a new concept. Might work, moght not. Maybe none of these brands appear next year. Who knows for sure, except some people at Lego. Don't look too far ahead. This is for you to decide on your own. If you ask people questions like this, it could turn into a angel-devil argument and youll end up being more confused. But, if you really insist, then what i do every year is get a little bit of each theme that I enjoy, and buy what sets I think are good. Unfortunatley, ive had to give up a theme for now (Castle) because i dont have enough money for it. The only thing i really like in Castle are the figs, so hopefully itll pull me back with elves next year. But do what you like, its a matter of personel opinion, and i recommend you do what you think is best. OK thank you everyone for helping. I think ill do Indy and Elves, because like you said HP6 proably wont happen . Thanks for your opinions! Well, if it was me, I would choose Indy or Castle...and I would have a hard time choosing between them. Really, just try to think of what your favorite theme out of all of those is. Take these questions in mind - Which do you have the most of? Which theme would you like to have a complete set of? Which ones can you afford? This is a LEGO site, I'll move your topic to community, where I honestly hope it dies a slow death. Fake LEGO is stupid, but we don't need everyone flaming this user. Next person to insult him personally gets their account suspended, understood? Buy neither, and instead save your money for actual Lego products. Why because of the worse quality, and the fact that there both complete of Lego. 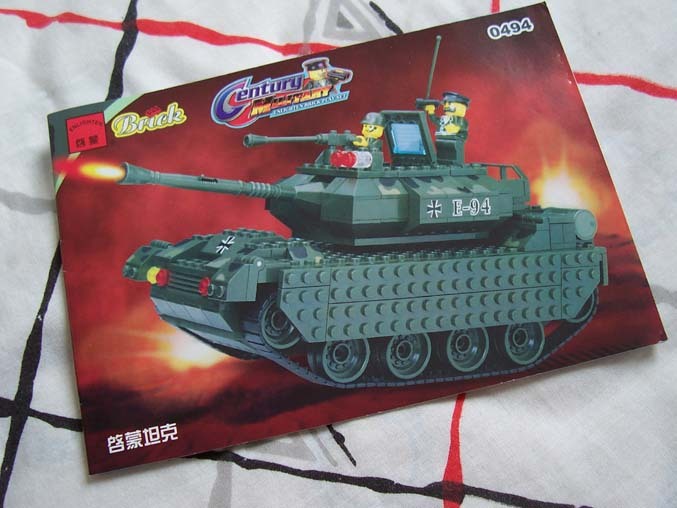 If you want a tank I would suggest instead designing one in LDD and then buying it, or just get all of the parts that you might need at pick a brick, as I'm sure your MOC would be better then either of the clone brand tanks. BTW this topic should either bin the Buy sell and trades forum, or culture and multimedia (since it's not about Lego ). Why?! Why would you want a fake LEGO set? !